Not only do we offer wedding gowns, we also offer bridal jackets. Bridal jackets are a great way to amp up the style of a simple wedding gown. They are a stylish solution to add coverage to any gown that needs it. If you need some added warmth on a nippy evening a bridal jacket is a wonderful option. Our Cassatt jacket buttons up the back, if you need to add sleeves to a strapless gown, this jacket looks like a permanent part of the dress. 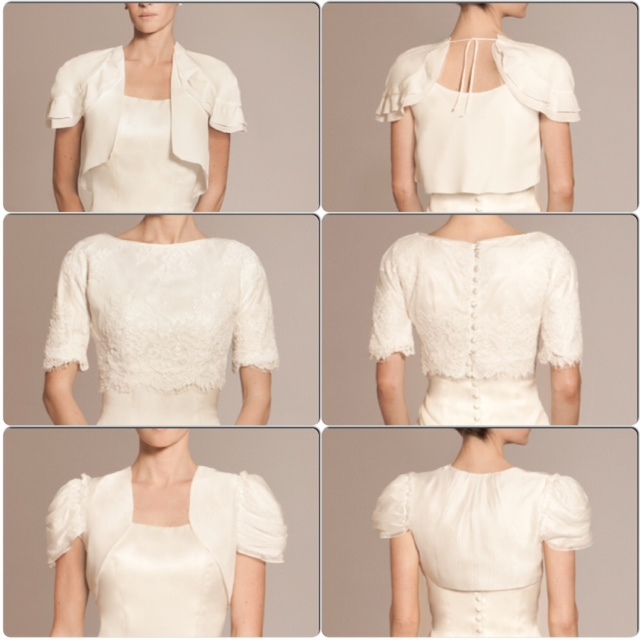 Our bridal jackets look great when paired with sheath, trumpet, A-line or ball gown silhouettes. Our jackets our shown with our Curie gown. Visit our website for more details about our bridal jackets.